I'm such a fan of the Body Finder series! I really enjoyed reading the fourth book in the series, Dead Silence by Kimberly Derting. I've been going through a bit of a reading slump lately but I can always count on this series to be exciting and deliciously tense and addictive and it quite successfully pulled me out of my reading funk. This is the fourth book in the series so while I have not included spoilers for this particular book, my review will contain spoilers for the previous books. Please don't read any further if you haven't already read the rest of the series! I do love Violet's story. At the end of the previous book my heart went out to her completely. Her ability to see and hear the imprints of murderers and the echoes of the dead has led her to do good things. But after Violet kills her abductor in self-defense, she acquires an imprint of her own and cannot escape this constant reminder that she has taken another's life. It weighs heavily on Violet. She's unable to sleep and is forced into taking sleeping pills by her creepy and more-than-slightly threatening therapist, Dr. Lee. I think what I love about this series so much is how much Kimberly Derting mixes things up. There's always a murder that happens, this crime that Violet is in some way connected to or is trying to help solve. And there are always those tantalising chapters told from the point of view of the murderer. It could be a series that always ends up feeling samey or formulaic. But with each Body Finder book I've read, the tension levels are always really high, the action is pacey and exciting and my heart is in my throat because I really care about these characters and especially about Violet. 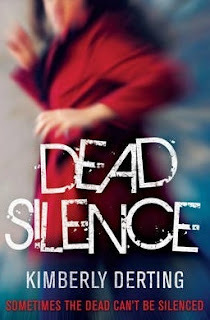 In Dead Silence not only is Violet dealing with her new imprint, she's also pretty understandably upset at being threatened and forced into remaining a member of a team that she wants no involvement with. I'm glad that within Dead Silence this thing between Violet and Dr. Lee is explored a bit more. With some new information, Vi is able to piece together a bit of background on her somewhat shady therapist. I liked it. And besides these forced weekly appointments with Dr Lee, to further involve Violet in things both Rafe and Gemma enroll at Violet's school. This causes Violet's two different lives - one as a normal high school teenager with normal friends who don't know about her special ability and Violet, the body finder who is a member of this weird psychic team - to collide. That was fun and a bit awkward to witness. I wasn't the biggest fan of Rafe in the previous book, but the boy is growing on me. And I do like that there is a bit of tension between Violet and Jay in this book because of Rafe. Violet and Jay's relationship needs to be shaken up a little bit. This series is definitely one of my favourites. In Dead Silence Violet really pushes herself into revealing some of her closely-guarded secrets, she dives head-first into some seriously dangerous conditions in search of the truth and to protect her friends and she digs up some juicy bits of information that could explain some of those niggling thoughts she's had about this organisation that has put together her team. Dead Silence is exciting and interesting and I look forward to more. If you haven't already picked up the Body Finder series I ask you now, what are you waiting for? It better not be! I want better closure than what this book gives us!